1.Enjoy charges up to 8% faster than standard cables and transfers data at 480Mbps via USB 2.0. 2.Durable Nylon Braided cable jacket protects wire cores and resists kinks, with a 6000+ bend lifespan several times longer than original device cables. 1.The gauge of wire is so much thicker than competing cables such that it resists internal corrosion, abrasions and more. 2.Nylon Braided sheathing ensures reduces heating while fast charging over AC Adapter ensuring quicker charging rates and less time. Products can be ONLY sold by Ailkin- Fulfilled by Amazon. We offer 12-month Breakage Warranty for all charging cables in case of defective product.If you don't satisfied with our service or product, please contact us without hesitated. Universal compatibility:Fit with various devices,tablets and many other devices including Samsung, Nexus , HTC , Motorola , Nokia , LG , Sony , One Plus , Blackberry , printers,PS4 ,e-readers , X box , PS Vita , Nintendo DS , GPS devices , battery packs , wireless keyboards , cameras , camcorders , games consoles , hard drives Bluetooth speakers. Quick Charge&Sync:Thick gauge wiring and reduced cable resistance enable this cable to provide the fastest possible charge.Enjoy charges up to 8% faster than standard cables and transfers data at 480Mbps via USB 2.0. Premium Construction:Durable Nylon Braided cable jacket protects wire cores and resists kinks, with a 6000+ bend lifespan several times longer than original device cables. Extra Length: 6FT USB cable is long enough for you to use no matter at home or in the office. Also you may bring this extra cable while travel. It¡¯s convenience for daily used. 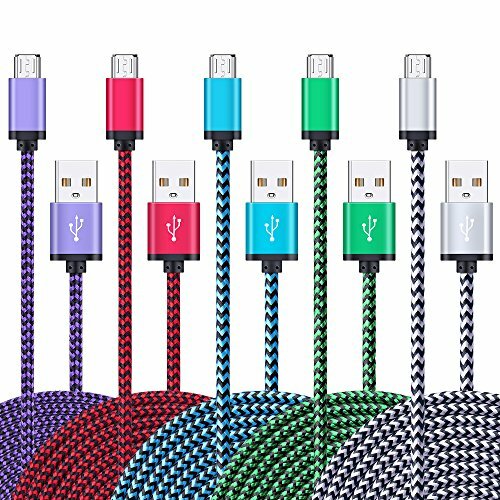 What You Get: 5 X colorful nylon braided USB cables. This product is sold exclusively by Ailkin, We offer 12-month Breakage Warranty for all charging cables in case of defective product. If you have any questions about this product by AILKIN, contact us by completing and submitting the form below. If you are looking for a specif part number, please include it with your message.